Democrats in the General Assembly today released a joint Democratic Values Agenda for the 2018 legislative session. The ambitious agenda focuses on supporting the middle class and creating economic opportunities for everyone; opening access to education; protecting women’s health care; keeping Connecticut residents healthy; supporting Connecticut’s hospitals; and preserving our democracy. 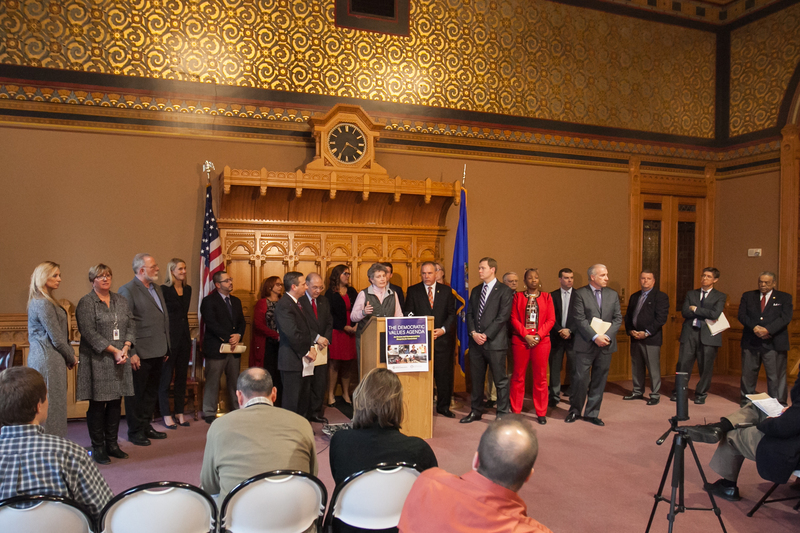 "We can build a better future for Connecticut by leaning into our strengths and values, not by running away from them," said Senator Mae Flexer. "Standing up for women's health and pay equity while expanding paid family leave and other just benefits will make our state stand out to young people. Building on the policies and traditions that give our state one of the best qualities of life in the nation will convince people to build their careers and families in Connecticut, paving the way for a stronger future for our state and one that we can be proud of." With concern growing regarding Connecticut’s water, air and other natural resources, Democrats in the General Assembly will call for a full and public vetting of issues surrounding Connecticut’s natural resources to ensure that they are properly protected and preserved for the people – not for businesses. Despite the expansion of access to treatment and other substantial policy achievements, the opioid epidemic continues to grip Connecticut. More than 1,000 Connecticut residents died from opioid-related overdoses in 2017 – more than from car accidents, homicides and suicides combined. Democrats pledge to continue to work with medical professionals and experts to preserve the gains already made and further expand access to treatment. With voting rights under attack across the nation, now more than ever Connecticut needs to protect everyone’s right to participate in our democracy. College campuses are where students get their housing, work, education, and meals – it is time that they also serve as a place where they can cast a ballot.